Foglifter : What is on your desk right now? Christopher Soto : Phone, pens and highlighters, post it notes, and a stack of letters. F : How is your full-length poetry manuscript coming along? What are you trying to communicate (about police violence and mass incarceration)? C : It’s coming very slowly. I don’t want to write more quickly or produce more often. I like my writing patterns. It’s just a slow process. Pertaining to what I’m trying to communicate in this manuscript- that’s a very long conversation. The short answer would be that I’m trying to decontextualize state violence so that it is witnessed as violence. I’m trying to do this by looking at police and prisons from interpersonal, anthropological, historical, and legal lenses. I’m trying to show alternative methods of responding to violence that are not based on punishment or social isolation. Then I am trying to show the prison as more than a physical structure and also a way of living entrapped by familial, social, economic structures. I want to think about what emancipation would mean and what healing would mean when released from prison. F : Why did you decide to write about that topic, beyond the obvious reasons? C : I fell in love with a boy years ago that was very deep into anti-carceral activism; so were a lot of my friends. Only then did I understand how deeply the American prison system has impacted my life—with family and friends and boyfriends who have been incarcerated. I was also arrested but not processed, etc. Now, everywhere I look I see prisons. When I think about how I navigate public space and social life it is not possible without thinking about the ways that my body is regulated by the police state. Every move I make feels monitored by some sort of prison or surveillance. F: What’s going on with Undocupoets? What direction is it taking, since you founded it? C : I tend to be out of the loop there. I’m not active with Undocupoets, now. I had to bow out because my work load got too heavy. F : This might tie in with the subject of your manuscript and the founding of Undocupoets, but what experiences thus far have contributed most to your education, as a writer/person? What would you say are your most prominent influences on your writing, currently? C : Part of writing slowly is that many influences impact my work. Currently, I am reading the classics because I have so often been reading contemporary American poetry. At the moment, I’m in the middle of Dante’s Inferno and learning much from the comedy and meditating on the epic, or long poem, as a form. F : What are the obstacles you’re facing in the creation of this manuscript? Any demons? Anything perhaps less ominous than demons? What prevents you from writing, if you will? C : I like the word “demons.” I think one demon that I wrestle with in the manuscript is one-dimensionality. I want the narrators in my poems to be complex. I don’t want a narrator who is only harmed and who is portrayed as some grand hero. I want a narrator that is also fucked up, causes harm, is attempting to understand how to react to their own propensity to cause harm. F : Do you think we’re making any progress in the publishing world for POC, queer and intersectional voices? And if so, how would you assess that progress? C : I think we’re making progress, in the sense that I no longer feel like the only editor of color. Though, I think there is much more work to be done in the literary field at large. I think more editors, Executive Directors, of color need to happen. And I also believe that systems change must be fought for when these folks of color are in charge, i.e. are the poems accessible to incarcerated folks, working class folks, etc.? Why or why not? What can we as a literary community do about it? F : How about folks outside of writing who inspire you currently? Why? C : Joshua Bennett is inside the literary community but also doing amazing activism, too. We have just met and began working together for the first time this year. I find myself very inspired by his poetry and activism at the moment. He found funds to create the June Jordan Fellowships at Columbia University. So aside from lifting up the name of June Jordan, he is also paying arts activists to teach and support working class communities of color who want to better understand and learn arts activism. He has become a bit of a role model to me this year. Natalie Scenters-Zapico is also on my mind much these days. She is teaching me much about kindness and literary citizenship on an interpersonal level. Im also inspired by Suzi Garcia and Carmen Giménez Smith who run Noemi Press and support so many brilliant poets and activists. F : Let’s change gears. You are more than just a writer. When you aren’t writing, what are you doing? C : Editing and promoting Nepantla, teaching the June Jordan “Poetry and Protest” course at Columbia, touring and speaking at universities, working at my day job in development, and trying to be a decent friend and family member. Sometimes I feel as if my calendar is too full and it doesn’t allow me to be as invested in my relationships as I would like. I’m trying to do less and go even more slowly with my life. F: Are you currently in love (whatever that means to you)? What does that do to you? C : I’m in love with many people and many books and lands and ideas. I think love is one of the most central components of my life. I think the word “love” is almost synonymous to “need.” I need you. Though, for me “love” is different than the word “need” because it demands reciprocity. I need you and I give myself to you. F : When are you next coming to see us in the Bay? Javier misses you! C : I love the Bay area. It has been my home twice in my life. I can’t wait to return. Christopher Soto (b. 1991, Los Angeles) is a poet based in Brooklyn, New York. He is the author of Sad Girl Poems (Sibling Rivalry Press, 2016) and the editor of Nepantla: An Anthology Dedicated to Queer Poets of Color (Nightboat Books, 2018). He cofounded the Undocupoets Campaign and worked with Amazon Literary Partnerships to establish grants for undocumented writers. In 2017, he was awarded “The Freedom Plow Award for Poetry & Activism” by Split This Rock and he was invited to teach a “Poetry and Protest Movements” course at Columbia University, as part of the June Jordan Teaching Corp. 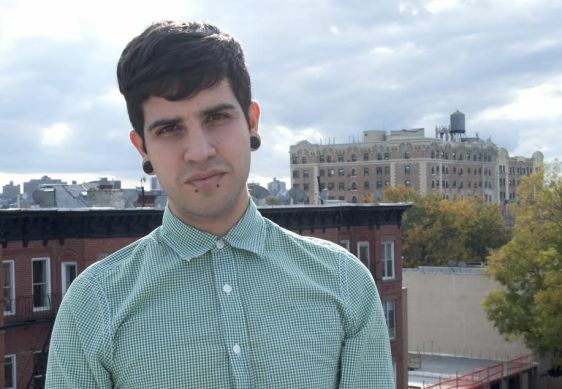 In 2016, Poets & Writers honored Christopher Soto with the “Barnes & Nobles Writer for Writers Award.” He frequently writes book reviews for the Lambda Literary Foundation. His poems, reviews, interviews, and articles can be found at The Nation, The Guardian, The Advocate, Los Angeles Review of Books, American Poetry Review, Tin House, and more. His work has been translated into Spanish, Portuguese, and Thai. He has been invited to speak at university campuses across the country. He received his MFA in poetry from NYU, where he was a Goldwater Hospital Writing Workshop Fellow.